Not only was Brandon Grotesque the most successful new sans serif of the year, it was also the best selling 2010 release overall. Designer Hannes von Döhren took a fresh look at the geometric modernist classics from early twentieth-century Germany. Giving Brandon long ascenders and descenders, he took his cues from the more stylish and decorative typefaces of that genre, such as Erbar or Kabel. Brandon Grotesque makes sensible use of the compass and ruler: the geometric shapes were optically corrected for better legibility and harmony. The rounded corners lend the typeface a softer look in large sizes. 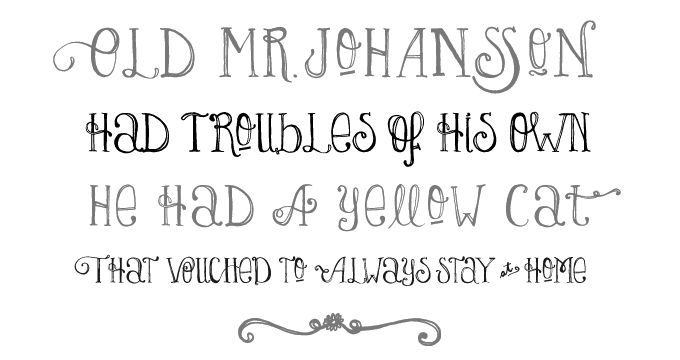 Lady René is probably the most whimsical and spontaneous font to have come out of Agentina’s Sudtipos foundry, usually known for its elaborate, polished script fonts (of which we will encounter a classic example below). In fact, Lady René was not drawn by one of the collective’s regulars; it is the first typeface by newcomer Laura Varsky. Born out of a love of illustration and a reverence for the written word, her font has the directness and spontaneity of a handmade drawing. Alejandro Paul’s hard work made sure that, although unpolished in nature, the font is technically impeccable, its character set full of surprises. Having joined MyFonts just over a year ago, Laura Worthington was one of 2010’s most outstanding designers, producing one best-selling font after the other. Origins was her biggest hit: a semi-connected calligraphic script with a confident flow. Based on hand-lettering with a Crow Quill pen on parchment paper, it has natural, rough outlines that contribute to its subtly antiquated feel. With gracious ascenders and descenders, Origins lends an elegant and somewhat formal touch to headlines, titling, invitations, branding and more. Stereotypes is run by designer Sascha Timplan, whose output these past twelve months has been quite something. St Ryde, his successful text and display face, joins the ranks of lively yet legible typefaces with rounded terminals (think Fritz, Sauna or Haptic). Combining a sophisticated structure with playful details, St Ryde has a logic and a charisma all its own. It is a semi-serif rather than a sans; while it swings and bounces at display sizes, it looks more static and regular when used small. With multiple figure sets, small caps and open italics, it was made for serious typographic work, in spite of its unorthodox forms. Alejandro Paul of Sudtipos is a master of that fascinating genre in contemporary type design that could be labeled “acrobatic scripts.” His ground-breaking Affair helped define the genre; it became available at MyFonts in early 2010 and has remained hugely popular throughout the year. Affair is one of those OpenType-programmed script fonts that need contemporary layout software to function as intelligently as it was designed; when using such OpenType-enabled programs, the font will help you select the ideal version of each letter in a particular combination to create amazing headlines and logos. Stunning stuff. Let’s hear it for another highly creative character from Berlin: Ulrike Wilhelm. Her one-woman foundry LiebeFonts (which is German for “sweet fonts”) published a series of witty, mildly successful picture fonts during its first year. It was her first alphabetical font LiebeErika that led to her breakthrough, skyrocketing into the upper reaches of our Hot New Fonts list. LiebeErika is special: despite its hand-made look, it is regular, lucid and readable. With well-drawn, supple curves and thin, compressed characters, it has charm as well as sensibility. It is also full of extras, such as cheerful alternate forms and figures, ligatures, nicely designed key words (“and”, “the”, “by”) and more. 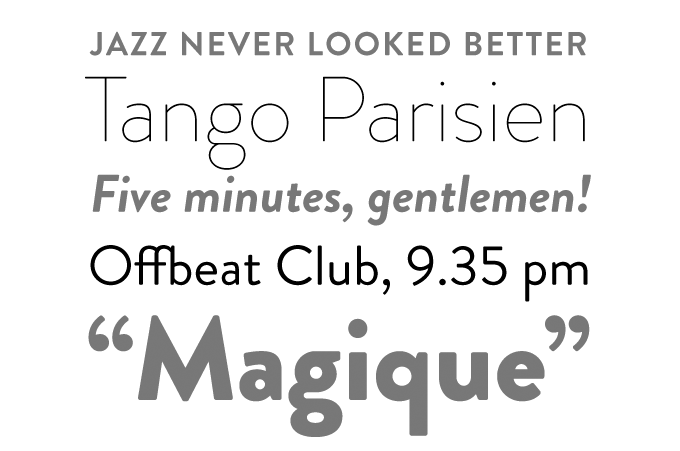 One of MyFonts’ greatest hits of the past two years is the Museo series from Jos Buivenga’s exljibris foundry. The family started out as a semi-serif, then branched out into the sans-serif genre with the cool, clean Museo Sans. Museo Slab logically completed the suite and, as was to be expected, it has been hugely successful throughout the past year. The sturdy slab serifs combine perfectly with the family’s friendly geometry, resulting in a wonderfully readable typeface. In the well-established genre of exuberant formal script fonts, Breathe by Maximiliano R. Sproviero is a special case. Designed to look alive, fresh and airy, the font takes a jump from the work of Didot and his contemporaries from around 1800 to today’s fashion of endless swashes and flourishes. Breathe Pro comes with over 1000 glyphs, including huge sets of alternates, swashes, historical forms, ligatures and more. 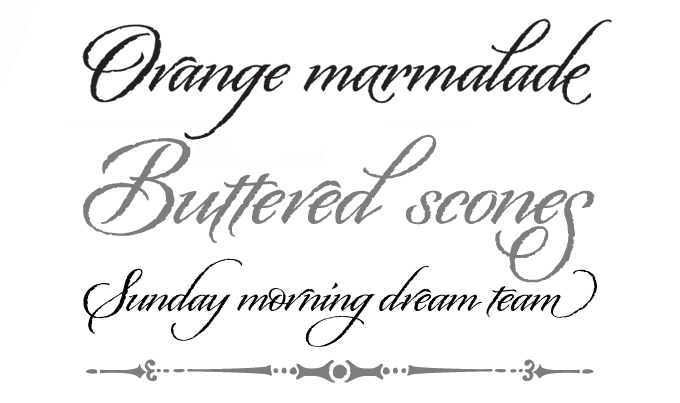 If you want a less intricate font in the same style, choose Breathe Standard. Sketching type was once a skill every graphic designer had to master in order to produce convincing mock-ups and tell the typesetter how the final result should look. With the recent crop of sketched fonts, the mock-up has now become the final product. Of the various hand-made versions of classics we’ve seen the last couple of years, Hiekka Graphics’ Sketchetik is the biggest hit. Based on that 1950s modern classic that is still the world’s best-selling font family today, Sketchetik combines lucid Swiss proportions with a loose hand-drawn look. Argentinean-born Ricardo Rousselot learnt from some of the best American lettering artists when working in Chicago in the 1960s. Having moved to Barcelona in 1975 he has drawn logos and developed packaging for some of the biggest Spanish brands. Rousselot, now in his seventies, has finally begun publishing his hand-rendered alphabets as digital fonts. Despeinada, the first release from his foundry EdyType, was an immediate hit: it has been the year’s most succesful informal script. Its name means “uncombed” — an apt name for this loose, spontaneous handwriting font that is rough and precise at the same time. Few foundries have been as successful last year as Hannes von Döhren’s HVD Fonts — in fact, two of his typefaces were among the year’s absolute best sellers. Livory was the biggest surprise: a thoughtful variation on the French sixteenth-century model, it was the year’s most popular oldstyle text font. Designed in collaboration with Livius Dietzel, its aim was to combine classic proportions with shapes full of verve and an audacious “fusion” of glyphs. The result is fluid and vigorous oldstyle without a trace of nostalgia. MyFonts Top Fonts of 2010 was edited and laid out by Jan Middendorp using Nick Sherman’s template, with type specimens by Anthony Noel. The title graphic is set in St Ryde.